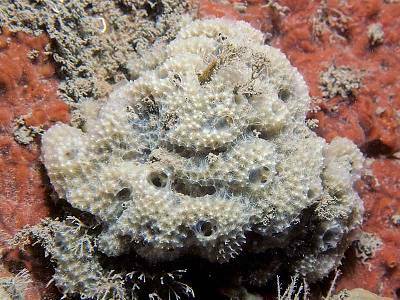 Description: This sponge is usually whitish or grey in colour but can also be brown. In cases where sand grains predominate over organic matter the sponge can assume the colour of sand. 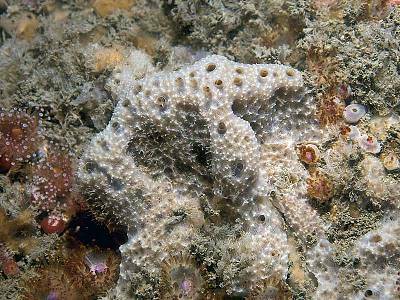 It may be thinly encrusting or cushion to massive lobose in form. 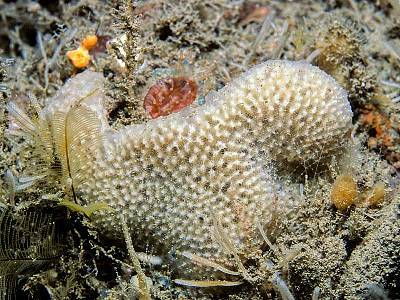 It is usually less than 15cm across, but can be greater than this in tidal, rocky estuaries. The surface is conulate, because of spongin fibres lifting the surface layer. The projections are sometimes lighter in colour than the main surface. 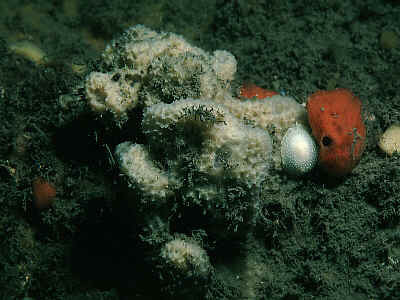 Habitat: An almost ubiquitous species under boulders on the low shore and on hard substrata in the sublittoral. Distribution: A common species throughout the British Isles. Similar Species: This species may be confused with Dysidea pallescens which is pink-purple in colour with relatively larger oscules. Picton, B.E. & Morrow, C.C. (2016). Dysidea fragilis (Montagu, 1818). [In] Encyclopedia of Marine Life of Britain and Ireland.